When I was planning Thanksgiving this year, a lot of it was pretty simple. After five years of preparing Thanksgiving dinner, I have a pretty good idea of timing, what works and where is best to go simple. So, when I was planning the menu I kept to several favorite dishes. That made the veggies and most of the sides easy. I say most because stuffing plagues me. Every year, I try a new recipe. Every year, I hear that it’s good. But no one recipe seems perfect for our Thanksgiving. Truth? I am not a big fan of stuffing (or dressing, if you prefer, since I don’t actually stuff anything). In fact, I dislike it so much that I nearly just made Stove Top. Yes, I am serious. Normally, I am not one to buy prepared mixes like that. 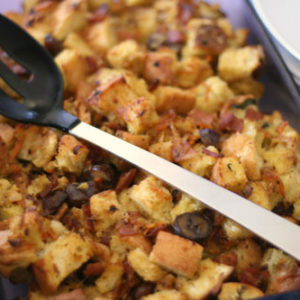 But when it comes to stuffing, I nearly just gave in, since I know we all sort of like it. 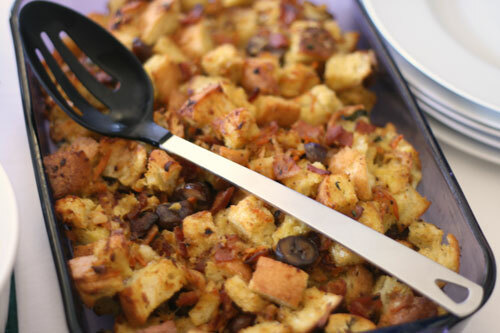 Then I saw the recipe for Giada De Laurentiis’s Ciabatta Stuffing with Chestnuts and Pancetta. It really got me thinking about giving homemade stuffing just one more shot. It looked and sounded so, so good. Unfortunately, I couldn’t make her recipe per se. See, I’ve recently discovered that when I brown pancetta, it gives me a horrid asthma attack. I have no idea why, but after cooking it three or four times with the same results, I realized that it’s something I need to stay away from for now. I know, it’s a bizarre thing to have a reaction to. Once I figured out my ingredients list (which is actually pretty different than hers), I whipped this up on Thanksgiving. I figured at worst, it would look pretty on the table … fortunately, it turned out much better than that. Though the ingredient list is decidedly long, and the prep includes about a half hour of hands-on time, it’s worth every second. The salty, smokey bacon is a great contrast to the slightly sweet chestnuts, mixed with the crusty and perfect ciabatta bread. I don’t need to search for a stuffing recipe anymore. This is the one. Preheat the oven to 350 degrees. Prepare your baking dish (glass - 15x10x2 inches) by rubbing the bottom and sides with butter. Set aside. Heat a large skillet over medium heat. Brown the bacon until crisp, then remove to a large mixing bowl with a slotted spoon. Add butter to the pan with the bacon drippings and set back over medium heat. Use a food processor to shred the onion and carrots (alternatively, you can chop finely or grate by hand. If you choose to do it either of those ways, prepare the veggies before starting to cook the bacon). Add the vegetable mixture, along with the garlic and herbs. Saute until the vegetables are soft and the onions are translucent -- about 10-15 minutes. Pour the vegetable mixture into the bowl with the bacon. Add the ciabatta bread and Romano cheese, and toss together. Add the chicken broth and stir until moistened. Sprinkle with salt and pepper and then mix in the eggs. Pour the stuffing into the prepared dish and spread out into one even layer. Cover with a large sheet of buttered aluminum foil, with the buttered side facing down (this prevents the stuffing from sticking to the foil). Bake for 30 minutes, until heated. Then, uncover the stuffing and cook for an additional 15-20 minutes until the top is crispy and golden brown.